Doncaster RLFC are boosted by the return of skipper Ryan Boyle in today’s Betfred League One derby against York City Knights at the Keepmoat Stadium (3pm). The prop has missed the last couple of games with a hamstring problem but proved his fitness this week. Last season’s joint top-scorers Kieran Cross and Jason Tali are also both set to return. Tali’s return to fitness after a two-week lay-off with a back injury means that there is no place in the squad for fellow centre Liam Welham despite showing up well in his absence. 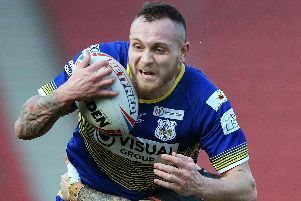 Former Super League star Richard Owen also returns after serving a one-match ban. The Dons will be defending an unbeaten record in all games this season in arguably their toughest test to date. Neither side were at their best in their respective wins over Newcastle and Keighley at the weekend and both clubs know they will have to raise their game for what is viewed as a key four-pointer. “It’s a massive game because they’ll be really up for it as they see us as one of the teams they expect to be challenging at the top of the table,” said Dons No 2 Peter Green. “They will have taken notice of our start and our results and they’ll be targeting us a team to beat. “Their head coach James Ford knows a couple of our players, including scrum-half Liam Harris who played for York on dual-registration from Hull KR last season. “They’ll certainly be aware of what he can do and they’ll be looking to try and close him down but there is more to the side than one player. “We know we’ve got a tough game on our hands.